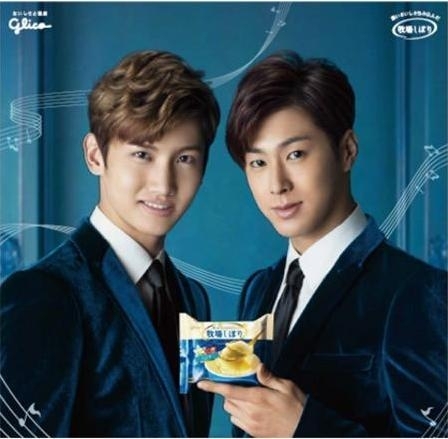 TVXQ have renewed their contract with the Japanese ice cream brand ‘Bokujo Shibori’ and have recently released a new commercial for the brand. During the episode of ‘Mezamashi’, FujiTV’s entertainment news program, that aired on the 18th, TVXQ’s new ‘Bokujo Shibori’ CF was revealed and it was announced that the group renewed their contract with the ice cream brand. ‘Bokujo Shibori’ was taken off shelves in 2011, but saw a 70% increase in sales after appointing TVXQ as the brand’s CF models in May, 2012, becoming yet another company to benefit from the ‘TVXQ effect’. 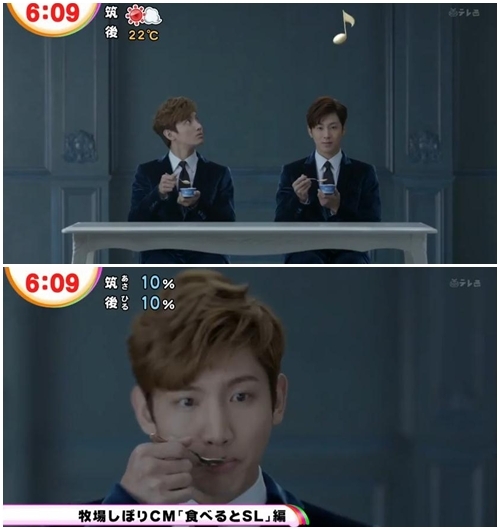 In the newly released commercial, musical notes are seen popping out of TVXQ’s heads as they eat their ice cream. Max Changmin hurriedly gulps down some ice cream when he sees a musical note pop out of U-Know Yunho’s head, and his curious expression puts a smile on the viewer’s face. Meanwhile, TVXQ’s sixth album ‘TIME’ was released on the 6th and sold over 200,000 copies in two days, proving yet again that TVXQ are the greatest Hallyu group of all time. TVXQ will also become the first Korean group to hold a ‘Five Dome’ tour, starting at the Saitama Super Arena on the 27th of April, and moving on to Tokyo Dome, Osaka’s Kyocera Dome, Fukuoka’s Yahoo! Japan Dome, Sapporo Dome and Nagoya Dome, attracting around 700,000 fans to the show.